Say "open sesame" to throw away your crap. Simplehuman's a pretty household name in, uh, households across the country, what with its sensor mirrors, stainless steel dish racks and automatic soap dispensers. Now it's come up with yet another innovation: a trashcan you can activate with your voice. Known as the Sensor Can with Voice Control, you can open it just by saying "open can" and "open sesame." It sounds pretty silly at first, but it's actually potentially pretty useful if both your hands are full of food scraps. Of course, you could also just get a trashcan with a foot pedal, but maybe you don't like those for aesthetic or design reasons. The Sensor Can also has motion sensors so you can wave your hand over to open it and pretend you're a Jedi (these are not the orange peels you're looking for), and those sensors also prevent the lid from closing if you're not done tossing stuff away. Simplehuman has already made a Sensor can with just a motion sensor, but this is their first with voice control. There are two versions of the Sensor Can with Voice Control -- one is a single bin, while another has two bins for separating out the recycling. I tried it out here at CES, and it actually worked well despite the loud din of the ballroom where the demo took place. You can also say "close can" to shut it. 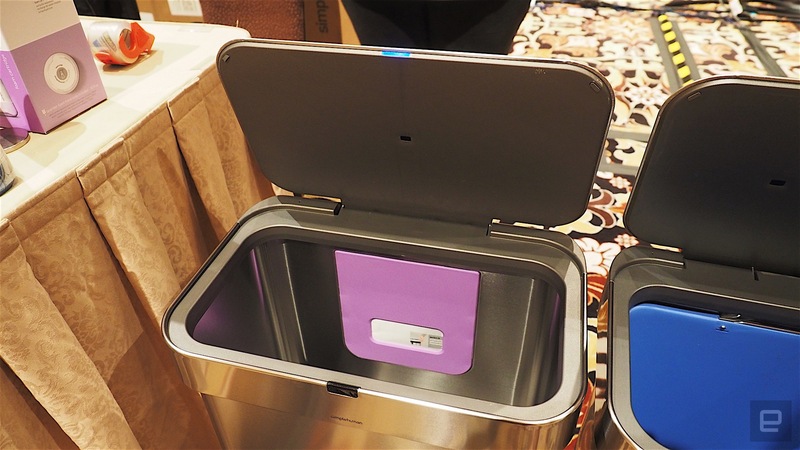 The single-bin trashcan will be available for $180 while the double-bin version will retail for around $230. Both should hit shelves in March. According to a rep I interviewed, the controls can be localized to different countries, so the command might be "Abierto" in Mexico, for example. It doesn't look like you can change the command yourself though, which is a bummer, because I'd love to be able to say "Open the pod bay doors, Hal" to throw away the trash.